Kosambi took up the matter in a short essay written in 1958. Since this piece has not been included in any collection of writings by Kosambi, it is necessary to quote long extracts from it and then critique his approach. Kosambi had also touched on the same issue in a section of his Introduction to an anthology of Sanskrit poetry which was edited for the first time by him and V.V. Gokhale.4 It will be my endeavour to show how Kosambi makes use of Marx’s formulation of the relationship between the base and the superstructure and how Kosambi demonstrates its validity in two disparate cases, namely, ancient Sanskrit literature and English literature of the sixteenth and early seventeenth centuries. Although Kosambi does not explicitly refer to Marx in this connection there can be little doubt that he drew his conclusions from Marx. The question that Kosambi had to face from others is: if Shakespeare’s plays reflect the class basis of the rising proto-bourgeoisie, why do they so often portray high nobility and rarely the bourgeoisie? Can we really ascribe any class basis to Shakespeare other than the feudal? Kosambi then believes that only the coming of a new class can give rise to a new type of literature and, conversely, in spite of all talents, writers who remain tied to the old class fail to produce any work of lasting merit. It is to be noted that during the period of transition all authors do not tend to look forward; some continue to cling to old mores and stick to outworn ideas. Hence both kinds of authors co-exist for quite some time. Kosambi does not deny that poets like Spenser were highly gifted; they had ‘no less skill, effort, mastery of words’ than Shakespeare or Donne. But their adherence to the old, outgoing feudal mode of writing ultimately made them fall short of such poets who had adopted the outlook of the new class. Thus the writer vis-à-vis the class position he or she adopts during a period of transition is of seminal importance. Other things such as skill, effort, and mastery of words that constitute literary merit may be equal, but the outcome will not depend on these factors alone. The extra-literary issue, namely, the class position adopted by the writer, is the ultimate determinant. Kosambi creatively applies this general formula to interpret the radical changes both in form and content in Indian literature in the new bourgeois era and, as a parallel case, cites the case of English literature after the advent of capitalism. He does not lay the responsibility for the dreary monotony of premodern Indian literature at the door of individual authors, nor does he deny their literary merit. He blames the socioeconomic milieu that produced them. He demonstrates why new forms such as social novels could not arise in the old mould – not because some author or authors suddenly wished to opt for a new form of writing but because a radical change in the class relations had brought forward the replacement of old genres by the new. More perceptibly he points out that in case of Elizabethan literature, even though the characters appear to bear the stamp of old feudal nobility, their attitudes have undergone a sea change, as in the case of Shakespeare’s tragic heroes. Thus mere appearance is not enough; one must go beyond appearance and look at the essence. So Kosambi finds at least one redeeming feature in classical Sanskrit poetry: in spite of all its limitations it is untainted by the despicable traits of the capitalist society! Kosambi, it should be remembered, was a polyglot and a voracious reader of world literature. He was as much at home with Aeschylus and Kalidasa as with anonymous Old English poets, medieval Italian satirists, Renaissance dramatists and Villon, Goethe, Blake and Shelley.30 He could quite casually refer to the Wayland Smith Saga as well as the songs composed by Russian soldiers in honour of their general, Dovator.31 His views on literature thus are not those of a dilettante but of one who was as much accomplished in his own field, mathematics, as in history and literature. 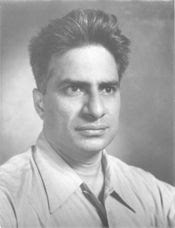 What constitutes Kosambi’s contribution to the sociology of literature is that he was the first among the Marxists to apply the externalist approach (originally developed in the historiography of science, then extended to other, wider fields) to the study of literature.32 In this respect he was at one with John Bernal, Joseph Needham, Hyman Levy and Lancelot Hogben. They were inspired by the works of some Soviet historians of science and technology in the 1930s and consequently adopted the externalist approach in their studies in the history of science, both of the east and the west. As opposed to those historians who believe that individual genius alone is to be credited for all developments in literature (a view known as internalism), Kosambi worked out a scheme which, without discounting individual talent, placed literature in its proper historical perspective. The internalist approach can never account for the fact why Mukunda Chakravarti or Bharatachandra Ray in pre-modern Bengal, despite their talents, could not make any breakthrough in Bangla poetry either in form or in content and remained confined to the age-old tradition of the Mangalakavya. There can be no room for doubt about their worth. What held them back was the absence of a new class to which they could link themselves. Kosambi’s externalist approach emphasizes the fact that in the absence of a new class and new aspirations, the poets of the past could not but remain confined to the old groove. His analysis also explains the phenomenon called Iswarchandra Gupta more satisfactorily than any other. Since Gupta adhered to the old decaying class and its outworn ideas even in a transitional period when class relations were being radically transformed in the early nineteenth-century Bengal, he could not be a pioneer in the field of literature. His junior contemporaries, Michael Madhusudan Datta, Bankim Chandra Chattopadhyaya and Dinabandhu Mitra, on the other hand, succeeded in bringing into operation both new forms and new contents. Students of art and literature too have much to learn from Kosambi. 2 Kosambi, 1948, “Editor’s Preface”. 4 Kosambi and Gokhale, 1957, lvii. 16 Kosambi and Gokhale, 1957, lviii. 17 Kosambi and Gokhale, 1957, lviii-lix. 18 Kosambi and Gokhale, 1957, lix. 22 For a detailed study see R. Bhattacharya, 2010, 21-38. 23 Kosambi and Gokhale, 1957, xlii. 24 Kosambi and Gokhale, 1957, lvii-lviii. 25 Kosambi and Gokhale, 1957, lxii. Elsewhere Kosambi has taken pride in ‘hav[ing] rescued over fifty poets [whose epigrams find place in the Subhasitaratnakosa] from the total oblivion to which lovers of Sanskrit had consigned them, not to speak of adding to our meagre knowledge of many others.’ 1986, 9. 27 Marx, 1961, 141 and 108. 29 Engels wrote this in a letter to Ferdinand Lassalle (May 18, 1859). Marx and Engels, 107. 30 Kosambi, 1986, 92; Kosambi and Gokhale, 1957, lx, xliv, lxii. 31 Kosambi and Gokhale, 1957, xlviii n.
32 For a brief account of externalism vis-à-vis internalism, see internet sources. Bhattacharyya, Ramkrishna. ‘Marxism and Classical Sanskrit Literature: D. D. Kosambi’s Approach and Assessment’, Revista di Studi Sudasiatici, No. 4, 2010. Kosambi, D. D. The Epigrams Attributed to Bhartrihari. New Delhi: Munshiram Manoharlal Publishers, 2000 (first published in 1948). Kosambi, D. D. ‘European Feudal and Renaissance Literature’, New Age (monthly), 7: 10, October 1958. Kosambi, D. D. Exasperating Essays: Exercises in the Dialectical Method. Pune: R. P. Nene, 1986 (first published in 1957). Kosambi, D. D. An Introduction to the Study of Indian History. Bombay: Popular Prakashan, 1975 (first published in 1956). Kosambi, D. D. Science Society & Peace. Pune: Academy of Political and Social Studies, 1986. Kosambi D. D. and V. V. Gokhale (eds.). The Subhasitaratnakosa Compiled by Vidyakara. Cambridge, Mass. : Harvard University Press, 1957. Marx, Karl. Economic and Philosophical Manuscripts of 1844. Moscow: Foreign Languages Publishing House, 1961. Marx, Karl. A Contribution to the Critique of Political Economy. Moscow: Progress Publishers, 1970. Marx, Karl and Frederick Engels. On Literature and Art. Moscow: Progress Publishers, 1976.
it is all merely based on myths. They are never really broken with. all the future generations to come. that path which would have given perhaps modern philosophy a new life. the symbol from which it revolted. itself utterly bankrupt in ideas as India had.